Anxious, aching, depressed or in pain? Relax deeply while essential minerals and dynamic botanical oils rejunveate your muscles, restore your energy, and lift your mood. 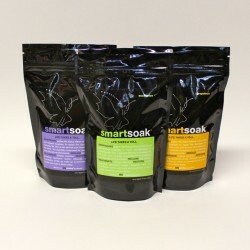 Dissolve into our naturally dechlorinated smartsoak® today. Perfect for athletes and the ailing, gardeners and grade-schoolers, and YOU! DISSOLVE entire contents in a tub of warm water and soak for at least twenty minutes. The longer you soak, the greater the benefits. And don't scrimp. It takes the whole bag, plus the bicarbonate insert, to get the full healing effect. Better still? UNWRAP a bar of our creamy washup coconut soap and SURRENDER to your smartsoak experience. Perfectly sized for travel, too. Makes an ideal gift. LAVENDER to encourage restful sleep and peace of mind. EUCALYPTUS to relieve sinus congestion and ease flu symptoms. GRAPEFRUIT to restore energy and reduce appetite. Ingredients: Magnesium sulfate, sodium bicarbonate, asorbic acid, juniperus communis (juniper), and either lavandula angustifolia (lavender), citrus paradisi (grapefruit), or eucalyptus globulus (eucalyptus) depending on your selected infusion. Also available in gift sets! from recycled banana peel for all our Duggan Sisters gift sets. Explore all our gift set options. get outback and washup soap. tea tree.